The coalition agreement process to date is that Act, with 5 seats, and United Future with 1 seat, have pledged support to National on confidence votes. This combination brings a total of 65 seats in the 122 seat Parliament. Negotiation with the Maori Party is in process, with the possibility of Ministerial posts to establish wide based support for National in Parliament. If a coalition agreement is made with the Maori Party, the National led government will have 70 seats in a 122 seat parliament. At present the Maori Party is undertaking consultation with their constituents on a proposed agreement. CPI adjustments to benefit payments, in line with inflation, to be enshrined in legislation (at present these adjustments are not required by law). Allow beneficiaries to earn up to $100 per week before the benefit is abated. Introduce graduated benefit reductions for beneficiaries who don’t meet their work obligations. New Gateway Housing is to free up Crown land to provide for State Housing, with offer of purchase after 10 years. Keep income related rents for State House tenants, with offer of purchase to tenants of state houses. At time of finalising this Policy Watch, details of coalition agreement policies have not been announced. NZCCSS has also created a table of policies announced by all main parties during the Election campaign (links to PDF). John Key promised to carry out a series of ‘actions’ in the first 100 days of being in Government. The priority will be National’s tax package, to begin their programme of tax cuts 1 April 2009. There will be a review of the financial state of the economy and the implications of the international economic crisis. Other areas identified for the 100 day plan are reform of the RMA, implementing a relief package for NZers hit by redundancy, and review of public service spending. Examples of Law and Order priorities are to remove the right of parole to repeat violent offenders, and to clamp down on gangs and the drug trade. Another target for Law and Order is enabling police to issue protection orders to protect victims of domestic violence. Compensation for victims will be paid for through criminal contributions to a Victim’s Compensation Scheme. In Education, the 1989 Education Act is to be amended to set National Standards in literacy and numeracy. Health proposals include funding for Plunket Line and making a 12 month course of Herceptin available. Student debt write-off will be offered to teachers, doctors and nurses in return for working in hard to staff communities and specialities. CPAG has called on the government to extend the Working for Families In-work tax credit to all low income families as an anti-recessionary, anti-poverty action. The reason for this call is that benefits need to enable families to meet basic needs, including housing and food costs. The Children’s Commissioner Cindy Kiro has released the results of a survey commissioned by the Children’s Commission, which shows that 80% of adults surveyed, agreed that children should be entitled to the same protection from assault as adults. A Pacific Providers fono for community , service users and families is focussing on cultural approaches to mental illness. Appropriate methods for countering stigma and discrimination against people experiencing mental illness will be discussed. Regional providers of the Like Minds programme will develop their programmes for the coming year. Like Minds, Like Mine is a programme to reduce the stigma of mental illness in specific population groups. Our interests in Social policy and poverty issues are shared with many other countries. Oxfam has just published a report on the implications of the financial crisis on poverty ‘If Not Now, When?’. A press release from Director of OxfamNZ, Barry Coats, noted that the total Aid to developing countries last year was $186m, and the US and EU have mobilized $5 trillion (30 times $186m) to bail out their banks. Three calls from Oxfam are to honour the OECD pledge not to reduce development assistance, establish international regulation of financial markets, and build a new global governance system to tackle the economic, food and energy crisis. 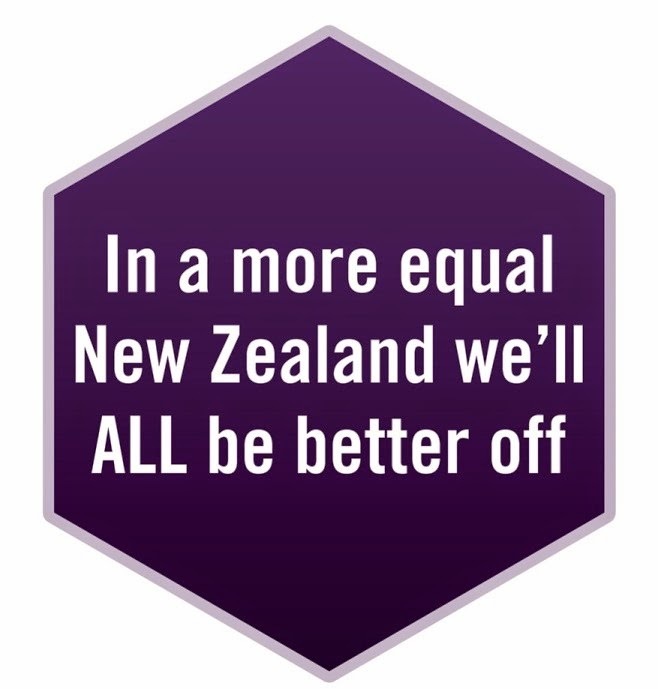 ( NZ contributes 0.3% of GNI, and the UN target is 0.7%). It is worth checking out the Caledon Institute of Social Policy, a Canadian research institute, and their latest publications. As a private charitable organisation established in 1992 the purpose of the institute is “to inform and influence public opinion and to foster public discussion on poverty and social policy. The institute develops and promotes concrete, practicable proposals for the reform of social programs at all levels of government”. The Poverty Policy report by Sherri Torjman, published just last month, outlines the core components necessary for effective poverty reduction strategies – many of these align with the core messages of NZCCSS. Also of interest is the November 2008 publication by Anne Makhoul called Bold Solutions for Tackling Poverty. Everyone aged 65+ who has an email address is invited to join Age Concern’s SeniorVoice consultative group of older people. It only involves a few minutes per month and it's a good opportunity to contribute opinions and local knowledge to Age Concern's national advocacy work. Note: The Retirement Villages Code of Practice which comes into force 2 October 2009 has been cautiously welcomed by Age Concern NZ in a press relase which outlines their reservations. This is a central theme of the Department of Internal Affairs Sustainable Urban Communities consultation currently taking place. It includes an emphasis on social success – strong communities, community safety and a wider range of housing choices including more affordable housing options. Submissions close 28th November and NZCCSS encourages those who have an interest to make comments and suggestions out of your own success stories in social services. If you are making a submission, please send us at NZCCSS a copy and we will also be making any comments and submissions available on our website. More information and the submission form is on the DIA website. CHA conference in Wellington this week, a call was made for a $2 million venture capital fund to stimulate development of the community housing sector. A building industry incentive would be beneficial in the light of the economic downturn, when the negative effects for the building industry could be offset by activity in the Community Housing sector. The Salvation Army has published a housing update report available on their website.